Disneyland Pictures, Stories, and Rants! Yeah, it's a pink teacup. So what? 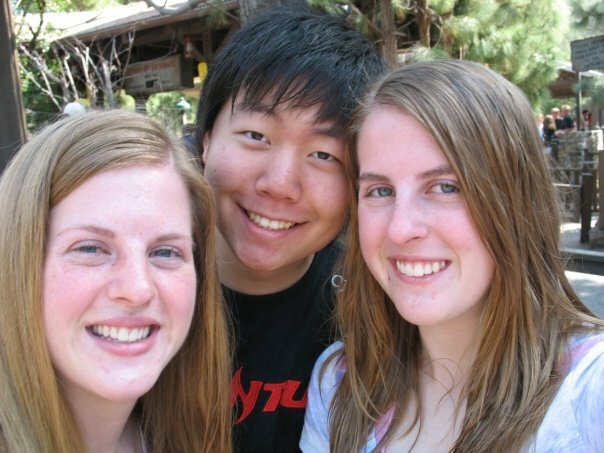 1) The 3 of us (Kelly, her sister, and me) were hanging out in California Adventures (the park across from Disneyland). We're browsing some of the cool items in a store and some weird person puts their hand on my shoulders. I turn my head to look and them and it's WOODY FROM TOY STORY! I was so surprised I had no time to react when he walked off. It turns out we were right next door to their back-stage area for a show that was happening in 5 minutes. Cinderella and Sorcerer Mickey are also there! I managed to get a picture with Mickey! I don't stand in line for Sorcerer Mickey, Sorcerer Mickey comes to me. 2) We were standing in line for Space Mountain and right before we get into the rocket I see a familiar face. Somehow, randomly by chance 4 of my friends are there in the park, standing about 10 people in front of me in line. What are the chances of that? I had no idea they would be there that day. Well anyway, we agree to meet up later to watch the fireworks show (which by the way, is pretty amazing). We arrive in front of the castle at around 9PM and manage to find a spot with a really great view. However at 9:15 or so they start giving the notice that due to the winds at high altitudes, the show may be canceled. Now, the last 2 times I was at Disneyland, when they gave those warnings the show never happened. So we decide to go stand in line for Space Mountain. Since everyone else will be looking at the fireworks, the line for Space will be short. Unfortunately for us, it turns out a few hundred people had the same idea and we end up in a 45 minute line. About 5 minutes after we start standing in line, the fireworks start. And thanks to the layout of the Space Mountain building, the building blocks a clear view of the fireworks. Fantastic! 3) We were at a pretty decent hotel about a block away from the park entrance. I was taking a nap at around 6 or 7PM. I wake up as Kelly and her sister are freaking out about a spider. Now, I really really hate spiders. But from where I am it doesn't look too bad, so I sleepily head to the bathroom, grab a wad of toilet paper and head over to kill it. Yeah too bad the spider turns out to be a huge freak of nature with black and yellow stripes. I was so startled I jumped back onto the bed, lol. We call the hotel and request someone to come and kill it. The guy comes with a towel and when he walks over to the hotel even he is super surprised and asks us if it's poisonous and if it jumps. Anyway, no real point to this story other than that I hate spiders. -The minimum age for Disneyland should be whether or not they have diapers on or not. Seriously, if you still have diapers on you aren't old enough to enjoy the park. All you do is sleep, cry, or poop in your pants and make in unpleasant for me to stand next to you in line. -Strollers are annoying. Especially since half of the kids in them are too big to be in strollers, but are just lazy as hell. When your legs are touching the ground when you're sitting, you're too tall. Not only does it cause massive major traffic jams, it just perpetuates a culture of laziness. -Parents who don't leave the park at 9 or 10 PM when their kids are obviously too tired to stay in the park. When they are telling you how tired they are it's time to leave. -Disneyland is a really interesting place to people-watch. Soooo many weird people are there. My next blog will be about "People of the Day." Stay tuned! what did you think of space mountain? lol I thought this was gonna be a rant about getting banned from tl. Nice pictures, looks like it was pretty fun. is it just me or he kind of looks like Savior in this picture? lol i know you hate space mountain, and i would too if i had to wait in line for an hour. it's all about strategic timing and fast passes. with the exception of that fireworks 45 minute line for space, my average wait time was probably only around 15 minutes. I was in Magic Kingdom just last week haha...Fast Pass for Space Mountain gives you like a 5-10 minute wait. Our first time (without fast pass) was only 20-25 so it wasn't that bad. wait What!? no splash mountain pics ? did you go? nice that you're having fun! on space mountain when they take the picture we always do something retarded like pretend to be asleep or everyone is playing games on our phones, the picture never shows up at the end meanies. one of the funnest things you can do is go on the driving ride, drive out in the middle of the course where there isnt anyone watching, and just park your car and sit there, its really funny having hte car behind you being pissed and attempting to push you forward. And at the end of the track where all the cars are right next to each other waiting to get out of the ride, just hold down the gas pedal so the person behind you gets a face full of smog. 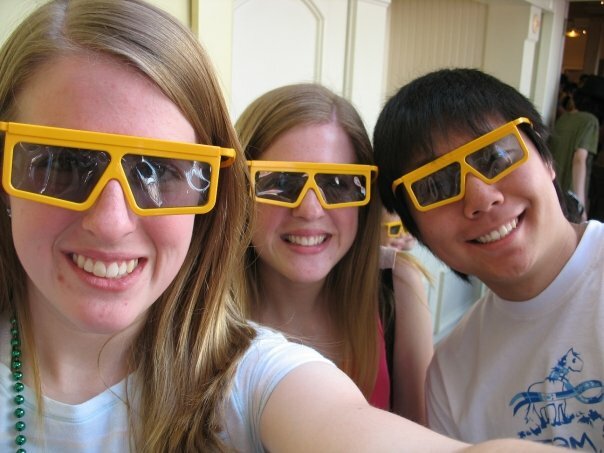 Awww nice photos - I've never been to Disney, but it looks pretty fun. hahaha! I thought the same thing! must of been the shirt ... or being sandwiched between two girls.